When walking down the fertilizer aisle at Watters Garden Center or any home improvement store you can’t help noticing the array of formulations. You’ll see bags and bottles, powders and granules, sprays and concentrates. Furthermore, you’ll discover an increasing number of organic and “earth-friendly” plant foods. Which one is best for your flowers? To pick the best flower food for your plant’s healthy growth you must make sense of these many choices. Nitrogen (N): Promotes healthy foliage and leaves. Phosphorus or Phosphate (P): Stimulates root systems, bud, and vegetable growth. Potassium or Potash (K): Promotes stronger stems and aids in flower (and fruit) formation. 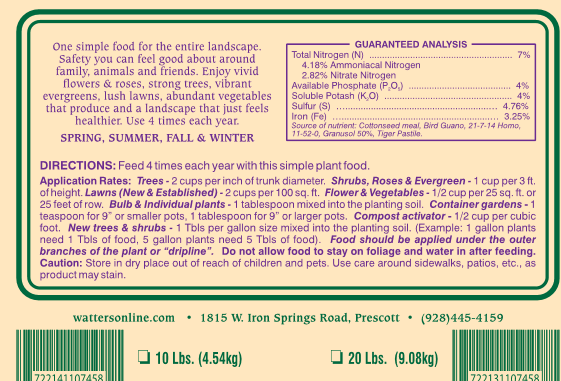 The fertilizer label will list the nutrients in the order of NPK, with numbers representing the percentage of nutrient compared to filler ingredients. For example, Watters 7-4-4 fertilizer contains 7% nitrogen, 4% Phosphorus and 4% Potassium. Filler ingredients are inert materials that add weight and volume to make the plant food easier to spread. For example, limestone, sawdust, and clay are used in powdered formulas, and water enhances liquid fertilizers. Fillers also add micro nutrients like iron and sulfur to the mix for increased plant health. Flower fertilizers like Watters Flower Power 54, 10-54-10, usually have a larger percentage of phosphorus compared to other ingredients. Healthy flowers start with vigorous root systems, and a phosphate boost can ensure your flowers get a good start. Chemical Fertilizers are inexpensive and widespread, but what are they? Fertilizer manufacturers like Scotts create artificial fertilizers by combining inorganic chemicals to form compounds like ammonium nitrate or magnesium sulfate. 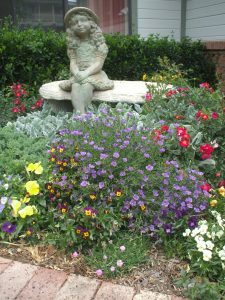 An advantage of chemical fertilizers is that rapid-growing plants, like annual flowers, take up their nutrients quickly, unless the formula is designed to be a time-release fertilizer. Disadvantages include the risk of over application, which causes burning, and the absence of any soil improving qualities. Chemical fertilizers come in a range of formulations, that include pellets, liquid concentrates, and powders. Some products come in pre-measured packets designed to be added to the watering can. These formulas make it convenient for the gardener to apply fertilizers to containers, gardens, houseplants, or landscapes. Chemicals have a negative potential to well water: If used incorrectly the chemicals are released so rapidly that they can taint the drinking water. Earth Friendly food is far safer. Foliar fertilizers are liquid nutrients that plants absorb through their leaves. Not all flowering plants feed efficiently this way because the waxes and hairs on the leaves act as a barrier to nutrient uptake, and as a result plants cannot receive all the nutrients they need. However, some nutrient deficiencies can be addressed quickly by using foliar fertilizers. Potassium is one readily absorbed nutrient in a foliar feeding application, so foliar fertilizers are appropriate for treating potassium deficiencies. If your flowers are exhibiting signs of chlorosis, yellowing of the foliage, your plants may have an iron deficiency. This is another situation where the rapid results achieved by foliar plant foods are effective. Organic fertilizers come from living things like barnyard manure, fish emulsion, and leaf mold, and from non-living things like rock phosphate and greensand. Disadvantages of organic fertilizers include their expense, taste appeal to some pets, and limited formulations. Organic fertilizers are not an overnight fix, so they can’t be used as quick solutions to correct severe nutrient deficiencies. If a soil test reveals a deficiency of one major nutrient, you can purchase a simple fertilizer, which contains only nitrogen, phosphorus, or potassium as a standalone ingredient. Simple fertilizers can be chemical or organic in makeup like organic bonemeal 0-10-0. Technically, all organic plant foods are slow-release, as it takes time for organic matter to decompose in the presence of soil micro-organisms. The slowest acting organic fertilizers include insoluble mineral fertilizers, like rock potash and other rock powders. Gardeners who want to feed plants once and forget them can shop for slow-release fertilizers that use silicone coatings to control the release of the fertilizer over a period of weeks or months. These types of fertilizers are especially popular in houseplant care. 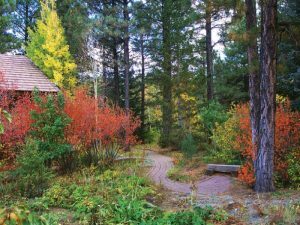 Best Advice – I’m a gardener who believes in organic plant foods because they are safer for us humans, our pets, and the wild animals that enter our landscapes. I use ‘All Purpose Food’ 7-4-4 for everything in the yard, including my container gardens and raised beds. I think you’ll agree that if your home uses a well for drinking water, you have pets, or you just want to be kinder to your plants and the environment then organic fertilizers out-perform what chemical foods can offer. 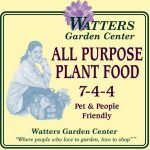 Until next week, I’ll be helping readers with plant foods here at Watters Garden Center.